I am new to the Produce UK team and my name is Livi Smith. Alongside my work at Produce, I am working towards a master’s in Urban Studies at UCL. Inspired by my interest in placemaking and the way spaces are used and experienced in the city, I am researching the role of church buildings in Camden as pockets of culture and creativity. Our work here at Produce UK is at the core of the practices I am looking at. How can culture be used to shape and enhance spaces in our cities and reinforce a sense of place? At the heart of this project, is a desire to understand the way church buildings are used, and how culture, creativity and community are nurtured in a changing city. The stories of industrial buildings transformed into artist studios, traditional markets into trendy centres, and the regeneration of seaside towns into creative and cultural districts are well versed. But what about other spaces in our cities? Churches are abundant across the urban landscape, and often have different layers of use. From religious purpose, to art galleries, to music venues, these spaces are dynamic and form a lesser recognised part of arts infrastructure in the city. My research asks, where do church buildings fit into the narrative of an everchanging, creative London? The focus of this project lies in the London Borough of Camden, though the tale of church buildings adapting for cultural and artistic functions is seen not only London, but across many world cities. In an economic climate where arts funding is harder to sustain, thinking creatively about ways to maximise cultural space and enterprise is vital. The major redevelopment of Camden has altered the borough’s cultural map significantly. For example, changes in Kings Cross have enticed an array of cultural activity and institutions such as Central Saint Martins. Yet, what about other pockets of space in borough the where creativity is unfolding? 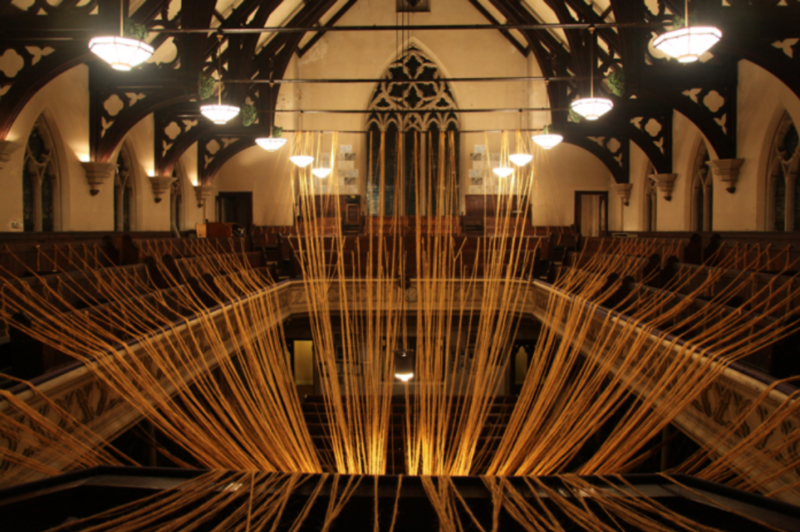 Increasingly, practising churches are the hosts of theatre, music concerts, fashion shows and art exhibitions. But why? Often the income from cultural activity in churches helps to maintain the building, but reasoning can run deeper. Arts events might feed into local identity or be a part of a wider social responsibility. Heath Street Baptist Church in Hampstead exhibits a host of artists at any one time, opens its space up to Sofar Sounds sessions and holds weekly workshops for kids with a local theatre company. Similarly, The Swiss Church just off Tottenham Court Road provides an exhibition space for Goldsmith’s MA Curating Programme and offers a studio and space for an artist in residence. This is not without its challenges and navigating a balance between a cultural offer in a simultaneously religious space requires sensitivity. Cultural uses can be found in former church buildings too. 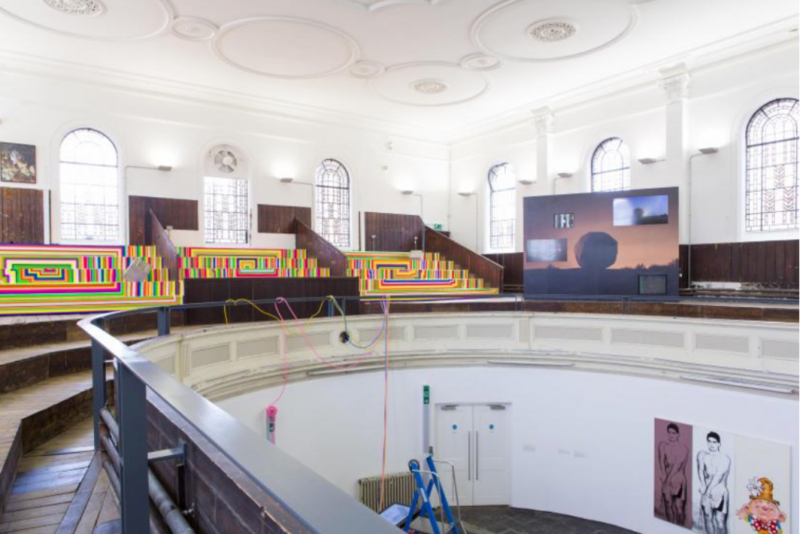 The Zabludowicz Collection on Prince of Wales Road in Kentish Town, is an art gallery and former Methodist chapel that looks to support emerging artists and curators without UK commercial gallery representation. Though the building’s use is no longer religious, it nurtures fresh creativity, maintains roots in community with its public engagement scheme and offers a compelling and challenging space for the presentation of art. Though a private space, Air Studios in Hampstead is another great example of a church building that is both a cultural assert and gives back to the community. It is one of only 2 studios in the country that can house a full orchestra for recording film soundtracks. The building was originally a church designed by Victorian architect Alfred Waterhouse, designer of the natural history museum. Be it churches that still have religious use, or those that are deconsecrated, there is something exciting here to explore. The way these buildings change and are being used, reveal something at the base of how people and society shape the spaces around us. It is wonderful to see creativity, culture and community blossoming in these unexpected pockets of our city.